Today, we're metaphorically traveling back to Canada to visit a brand we haven't heard from in a while. Recently, 19Fifties released a new pair of products: a gel-pomade and oil-based pomade. We'll be looking at the Union Oil Based this time and the Strong Hold next time. They changed the look quite a while back, but the new look has definitely been an upgrade. While it may not be inline with my preferences, it's difficult to not acknowledge how well done their current line is. 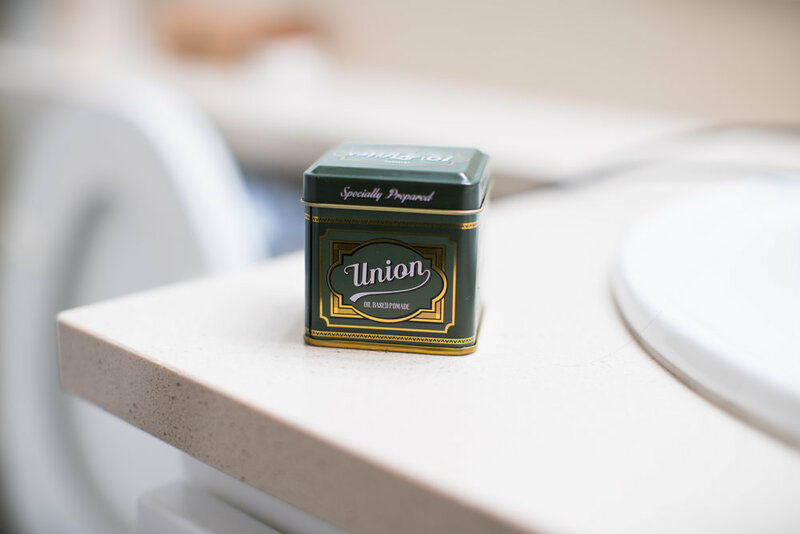 The Union Oil Based runs in an army green paint over a brass-tone tin can. The scent is green apple. It's straight up candy flavored aroma versus a fresh citrus. Super sweet. It's a super smooth scoop to get this pomade out of the jar. It even has that nice whisp to it when it comes out of the jar -- unique to medium holds. Lights being too greasy and heavies being more waxy. Applying this pomade is very easy, especially after all the clay pomades we've been working with. There is no grip or grit at all. Super smooth. The shine is unquestionable, but stops short of going overboard. Similar to the shine, it's a very slick pomade but stops before it gets noticeably sticky or too greasy. 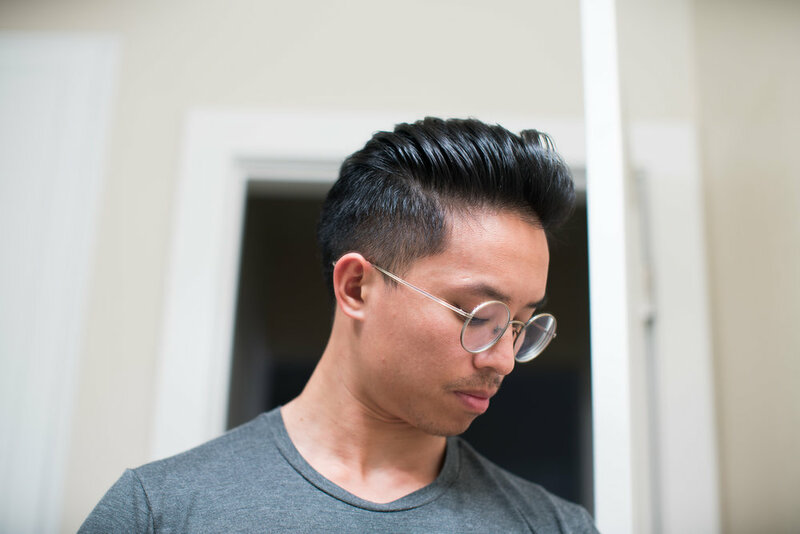 As you could expect from a balanced oil-based pomade, it was an absolute breeze to style. You can see in the photos that my hair dried with a strong part off-middle. Nothing but a very strong clay pomade or a super waxy oil-based could fully fight against it. But even with this medium hold, it was able to remedy the situation for the morning and keep a good pomp. I didn't go on a hike or anything today, but I did spend hours prepping and cooking food for the week. So, I guess you could say we put it through a test of heat and humidity. 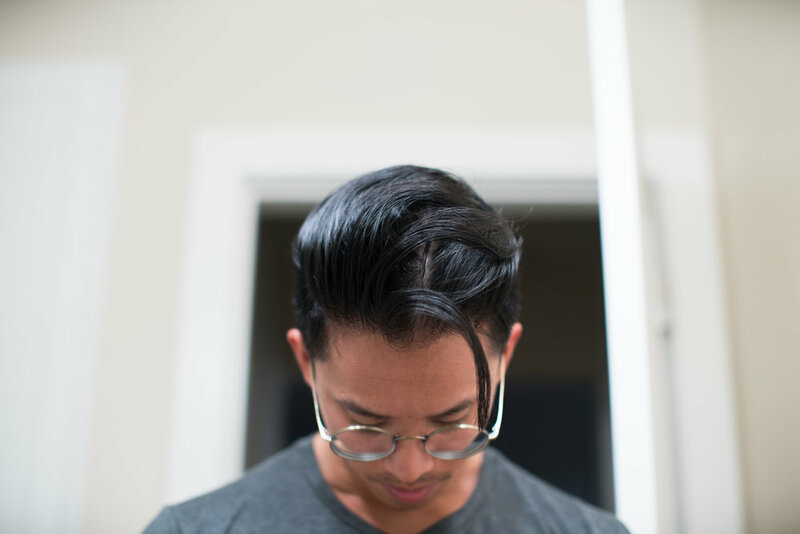 The pompadour fell apart rather quickly -- mostly due to the main reason why we use oil-based pomades. It never settles. Never hardens. Always remains workable. And so, at the same time, always remains susceptible to falling apart. It never stops being super soft. It can feel a bit greasy if you're prone to touching your hair and then your face (like I am). But it does NOT have a tendency to melt downward on your one's forehead. If your hair absorbs a lot of oil whenever you used greases like mine, then it'll only take one more shower to remove the pomade. If not, it can probably take at least two showers to fully remove the pomade. I appreciate this chance to use a balanced pomade. Nowadays, with the rise of water-based and clay pomades, oil-based pomades have moved to the realm of extremes for some users and brewers. But these oil-based that exude balanced hold with slickness and shine help use remember the reasons why some still choose to use greases. Union Oil Based is as medium as they come. If you're interested, feel free to use our promo code THEPOMP to save some money when ordering directly from 19Fifties.